TCEQ Rule Changes for Reverse Osmosis (RO) Use in Applications of 300 Gallons per Minute or Less. In addition, a Membrane Use Checklist Step 1 and Step 2 are required for submission as part of the submittal package to TCEQ. The Membrane Use Checklist (Step 2) is a detailed summary of the completed treatment unit that shows the overall performance based on the submitted manufacturer’s performance data. This is a reasonable approach for smaller applications that allows a faster response to otherwise questionable water quality facing many small public water supplies. In approaching the use of an RO system, the entity needs professional assistance in the technical application process as well as assessing treatment options and alternatives. Many times, an RO system is installed and put into use when other treatment alternatives are more appropriate for improving overall water quality. Cost of operation and maintenance along with the complexities of operation are all issues that should be discussed with the end user in selecting the best treatment option. RO systems create an aggressive water meaning a product that is more acidic, a pH range of 6.0-6.5 after treatment by RO. Blending the treated water with raw water typically will raise the pH to 7.0 to 7.5 well within the normal range for potable water and within the optimum primary standard requirements. The pH of the finished water is important for several reasons. The primary reason is due to the new Lead and Copper Rule. Flint Michigan and their many problems has raised the alert level in many regulatory jurisdictions, particularly with TCEQ who use other indices other than those published in the criteria to evaluate the corrosiveness of water. Corrosive water leaches lead and copper primarily from the customer side of the system and thereby could cause elevated lead and copper within the distribution system. The indices typically used are Modified Larson’s Ratio, Langelier Saturation Index, Ryznar Stability Index and the Aggressive Index. These indices are really used in evaluating scaling of water in cooling towers and boilers. They do provide a guideline of the likelihood of corrosive water based on the mineral content of the raw and treated water. The more buffer ions removed such as Calcium, Sodium, Carbonates and Bicarbonates, from the water in the RO process the more likely the pH of the treated water will tend to be more acidic and of concern. Careful water chemistry of the treated and blended water is required to assure a safe blended finished potable drinking water. Assessing treated water quality with a full mineral analysis and using the various indices, I found the Langelier to be the most helpful, is necessary to prevent corrosive water from being introduced into the distribution system. Advanced planning should be a key component of all utilities considering advanced membrane treatment. Planning and identifying various options to treat a water supply using RO or other nanofiltration systems should address the capabilities of staff and operational costs in detail prior to settling on a specific treatment option. This is required by TCEQ in the Engineering Report as part of the submittal to obtain approval for RO or advanced treatment. However, the utility should initiate the planning process early to identify the exact type of treatment required for the specific water in question. RO systems are maintenance intensive and require close attention to raw water feed, inlet pressure, chloride content, iron, chlorine removal and hardness. Rejection rates of 60% are common and membrane pressures of 180 to 200 psi are common. Energy costs and rejection rates must be evaluated closely prior to selecting this treatment method. These systems are very sensitive to changing raw water quality and therefore raw water quality must be monitored closely and continuously. Likewise, permeate or treated water quality must be monitored as well. Finished water pH should be adjusted prior to blending to assure the neutrality of the blended water pH. 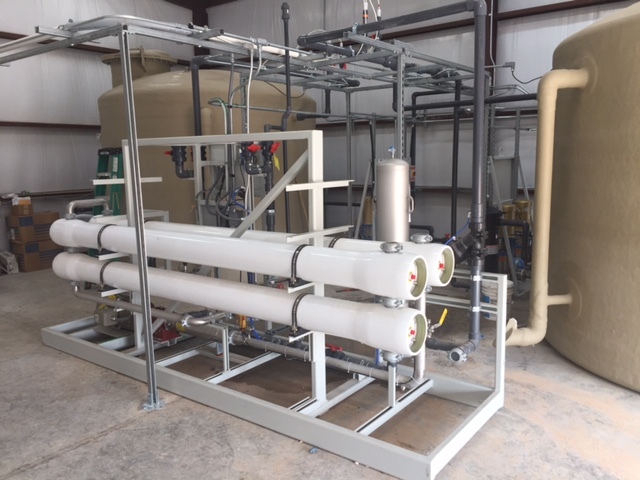 RO systems are becoming more popular because the technology has advanced to allow small systems to be easily adapted to use RO to treat less than favorable water quality sources. As the need for utilities to find additional water supply increases, less desirable water sources are being used to meet these increased water demands. RO systems are being used to treat these less desirable water sources, such as high nitrate, fluoride and arsenic, including brackish water sources. Careful evaluation and selection of these systems must be addressed and evaluated prior to installing these advanced treatment systems.